Krish Chakrabarty has been at Duke University since 1998. His current research is focused on: testing and design-for-testability of integrated circuits (especially 3D SOC); microfluidic biochips; hardware security; neuromorphic computing. His research projects in the past have also included digital print and enterprise system optimization, chip cooling using digital microfluidics, wireless sensor networks, and real-time embedded systems. Research support is provided by the National Science Foundation, DARPA, the Army Research Office, Semiconductor Research Corporation, Intel Corporation, IBM, and Futurewei. Other sponsors in the past have included National Institutes of Health, Office of Naval Research, Cisco, and HP. 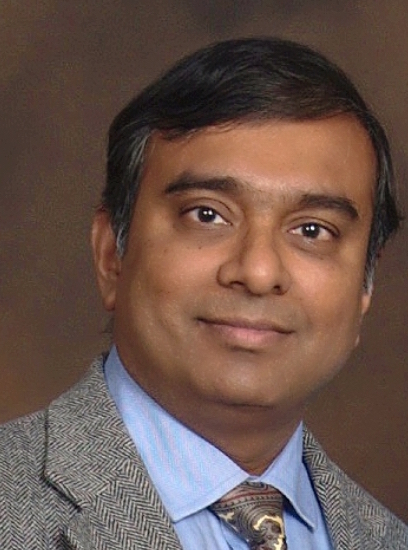 Prof. Chakrabarty is a recipient of the 1999 National Science Foundation Early Faculty (CAREER) Award, the 2001 Office of Naval Research Young Investigator Award, the Mercator Professor award from Deutsche Forschungsgemeinschaft, Germany, for 2000-2002, and best paper awards at IEEE Design Automation and Test in Europe (DATE) Conference (2001), IEEE International Conference on Computer Design (2005), IEEE International Conference on VLSI Design (2007, 2010), IEEE Asian Test Symposium (2012), IEEE VLSI Test Symposium (2013), IEEE European Test Symposium (2013), IEEE Transactions on CAD (2015), ICCAD (2015), and VALID (2016). He is a recipient of Duke University's 2008 Dean's Award for Excellence in Mentoring, and a recipient of the 2010 Capers and Marion McDonald Award for Excellence in Mentoring and Advising, Pratt School of Engineering, Duke University. He was also awarded the Distinguished Alumnus Award by the Indian Institute of Technology, Kharagpur, in 2014. Prof. Chakrabarty is currently serving as an ACM Distinguished Speaker. He served as a Distinguished Visitor of the IEEE Computer Society for 2005-2007, and a Distinguished Lecturer of the IEEE Circuits and Systems Society for 2006-2007. He is also a recipient of the Humboldt Research Award (2013) and the Humboldt Research Fellowship (2003), awarded by the Alexander von Humboldt Foundation, Germany. He holds 11 US patents (5790562, 8373493, 8775108, 8782479, 8832608, 9128014, 9201042, 9367268, 9482720, 9720036, 9864007), and has several pending US patents. He served as Editor-in-Chief of IEEE Design & Test of Computers during 2010-2012, ACM Journal on Emerging Technologies in Computing Systems during 2010-2015, and IEEE Transactions on VLSI Systems during 2015-2018. He is an Editor of the Journal of Electronic Testing: Theory and Applications (JETTA), and an Associate Editor of ACM Transactions on Design Automation of Electronic Systems, IEEE Transactions on Computers, IEEE Transactions on Multiscale Comuting Systems, and IEEE Transactions on Biomedical Circuits and Systems. He has completed terms as Associate Editor of IEEE Transaction on Circuits and Systems I (2006-2007), IEEE Transactions on VLSI Systems (2005-2009), IEEE Transactions on Computer-Aided Design of Integrated Circuits and Systems (2001-2013), and IEEE Transactions of Circuits and Systems II (2010-2013). Prof. Chakrabarty received the B. Tech. degree from the Indian Institute of Technology, Kharagpur, India in 1990, and the M.S.E. and Ph.D. degrees from the University of Michigan, Ann Arbor in 1992 and 1995, respectively, all in Computer Science and Engineering . During 1990-95, he was a research assistant at the Advanced Computer Architecture Laboratory of the Department of Electrical Engineering and Computer Science, University of Michigan. During 1995-1998, he was an Assistant Professor of Electrical and Computer Engineering at Boston University. Prof. Chakrabarty is a Fellow of ACM, a Fellow of IEEE, a Fellow of AAAS, and a Golden Core Member of the IEEE Computer Society. He is a Hans Fischer Senior Fellow at the Institute for Advanced Studies, Technical University of Munich, Germany. He is also an Invitational Fellow of the Japan Society for the Promotion of Science (JSPS), 2009 and 2018 (Short Term S, at the "Nobel Prize Level"). He is a recipient of two IBM Faculty Awards, the Semiconductor Research Corporation Technical Excellence Award (2018), the IEEE Circuits and Systems Society Charles A. Desoer Technical Achievement Award (2017), the IEEE Test Technology Technical Council Bob Madge Innovation Award (2018), the IEEE Computer Society Technical Achievement Award (2015) and the Meritorious Service Award. Prof. Chakrabarty was a Chair Professor in the School of Software in Tsinghua University, Beijing, China (2009-2013), and a Visiting Chair Professor in Computer Science and Information Engineering at National Cheng Kung University in Taiwan (2012-2013). He has held Visiting Professor positions at University of Tokyo (Japan), Nara Institute of Science and Technology (Japan), and University of Potsdam (Germany), and a Guest Professor position at University of Bremen (Germany).